This evening we made a delicious and simple dinner. It was another hot and muggy day here today so we decided to grill steaks for dinner (simply seasoned with Chipotle Garlic & Roasted Garlic Seasoning). I sliced and sauteed some fresh mushrooms in butter and made my Rich & Thick Parmesan Cauliflower Mash to enjoy with our steaks. 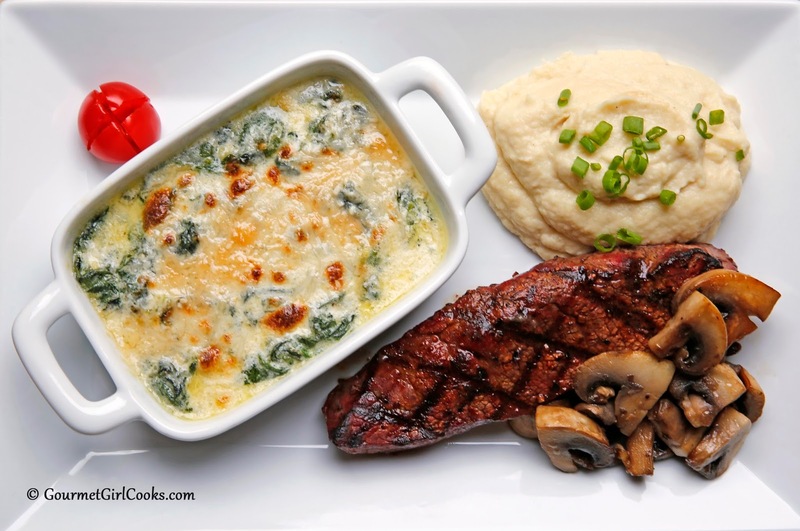 I also decided to make an easy low carb version of Creamed Spinach (one of hubby's faves) to go alongside our meal. It turned out delicious. It's rich and creamy and a little goes a long way. It's really quick and easy to make. 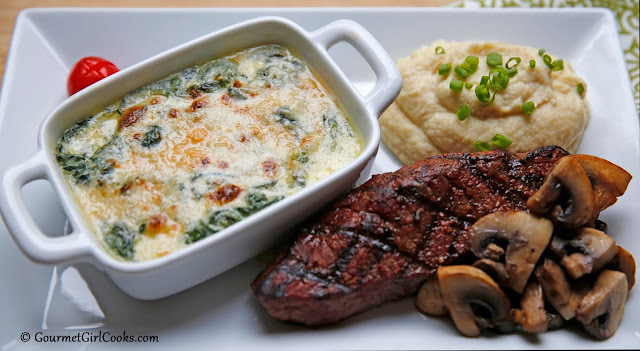 I snapped a few photos of tonight's delicious meal below as well as the recipe for my Creamed Spinach. Enjoy! In a large nonstick skillet, heat olive oil over medium-high heat; add onions and saute about 1 minute. Add spinach and saute lightly, just until wilted, 3 to 4 minutes. Transfer spinach to a shallow bowl and set aside. In same skillet, add butter and cream cheese, stirring frequently over medium heat until cream cheese has softened and melted into the butter. Add cream and finely grated Parmesan. Simmer uncovered (small steady bubbles) while stirring frequently until sauce begins to reduce and thicken. Season cream sauce with salt and pepper, to taste. Pour off any juices that accumulated from the spinach. Stir spinach into sauce and heat together about 2 minutes. 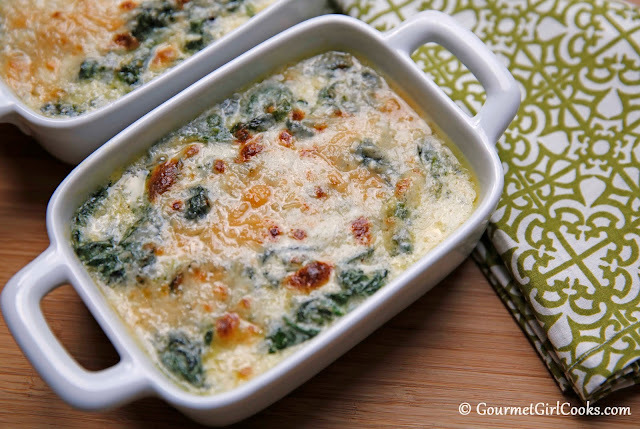 Transfer creamed spinach to individual ramekins or a small casserole (approximately 11" x 7") and top with shredded Parmesan. 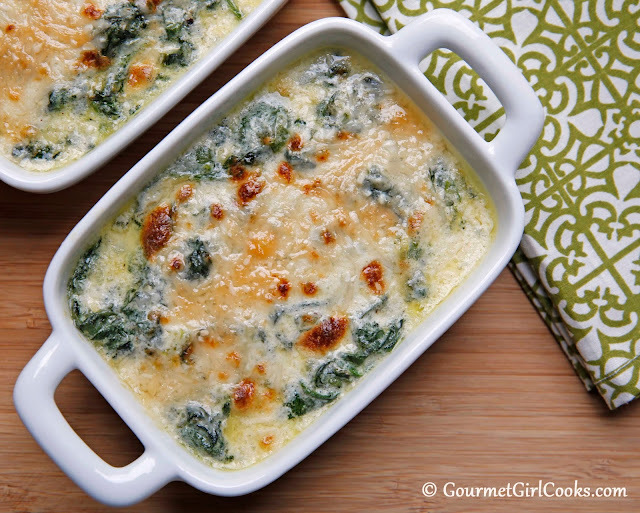 Run under hot broiler for several minutes until cheese is bubbly and light golden brown. Let sit for about 5 minutes before serving.